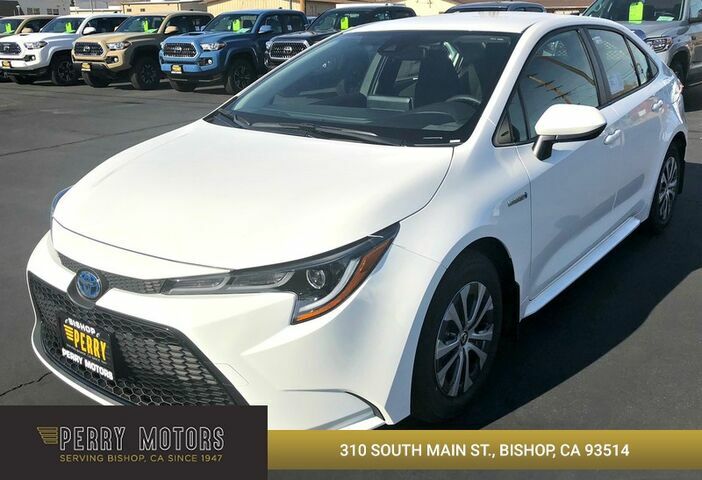 This outstanding example of a 2020 Toyota Corolla Hybrid LE is offered by Perry Motors. This Toyota includes: DOOR EDGE GUARDS (PPO) ALL-WEATHER FLOOR LINER PACKAGE Floor Mats 50 STATE EMISSIONS REAR BUMPER PROTECTOR (TMS) (PPO) MUDGUARDS (PPO) *Note - For third party subscriptions or services, please contact the dealer for more information. * This is about the time when you're saying it is too good to be true, and let us be the one's to tell you, it is absolutely true. You could keep looking, but why? You've found the perfect vehicle right here. The Toyota Corolla Hybrid LE will provide you with everything you have always wanted in a car -- Quality, Reliability, and Character. All pricing and details are believed to be accurate, but we do not warrant or guarantee such accuracy. The prices shown above, may vary from region to region, as will incentives, and are subject to change. Vehicle information is based off standard equipment and may vary from vehicle to vehicle. Call or email for complete vehicle specific information. $85.00 Doc Fee is also not included in price.